Celebrity Trainer, TV Fitness Expert, Neuro Performance Specialist, and TBI Survivor, Shawnee Harkins. Don't let the fear of trying something new take away your chance of discovering something you love. Check out or newest EFHQ Coach's Corner Podcast: Round Table 2.0 with the EFHQ staff as they discuss New Year's Resolutions and some of the things they notice with newer clients and how we strive to create an environment that breeds success! In this episode of EFHQ Coaches Corner, Coach Mo and Coach Bradon head to the home of the Walsh's, a family within the #EliteFam. Check out our interview with the Walsh's and hear their testimonial for Elite Fitness HQ and get a feel for what it means to be a part of the Elite Fam. Coach Mo and the Original Mosciples Anastasia Stewart and Bradon Hunt discuss what it means to follow The Elite Way and establish the 3 Pillars of Beliefs that we follow at Elite Fitness. In this episode, you will receive insight into what we believe in and how we go about living our lives inside and outside the gym. Take a listen! Check out an EFHQ interview with #EliteFam member Stephanie Kiser about losing 80 pounds in 1 year! In this episode of The EFHQ Coach's Corner Podcast, the EFHQ Staff establishes the 3 Pillars of Belief behind The Elite Way and introduce Pillar #1, Hard Work Dedication. Each coach talks about what the phrase means to them and how they have come to adapt this mind set. They also discuss how they implement this mind set with everyone they come in contact with, whether it's members or interns. Enjoy! I am the mother of 3 children, a wife, a nurse, and a fitness fanatic. I love living a healthy and positive lifestyle. My inspiration and creativity comes from a variety of places, mostly popping up in the early mornings, during naptimes, timeouts, or during a good workout. My house is messy 90% of the time (can I get an Amen!) and the other 10% of the time is consumed with me shampooing who knows what out of my my carpet!(!! ), after stepping on Legos, of course! I am obsessed with school supplies ( mainly multi-colored highlighters and Post-It notes), Scripture, peanut butter and coffee...Oh, and I am passionately in love with my Jesus. My family has been in the tee-shirt business for 40 years, and I found there was a lack of stylish and comfortable products in the market place. Apparel that speaks life and truth and playfully reflects life as a mom. The lack of humorus, Spirit-filled apparel led me to realize I could help fill the void. To create everyday wear which would reflect the value, power, and love promised to my children and myself, by Our Loving God. My desire is to create and produce quality clothing which remind them they are precious and made for more. Coach Mo & Bradon talk with adaptive athlete Vanessa Cantu & Rehab Specialist Jennifer Halwes. They discuss how gyms and coaches can better serve the adaptive athlete community. Vanessa and Jennifer have teamed up to build a network of Coaches an Athletes that can educate one another to better serve the community. We learn about Vanessa journey from injury to finding herself again through crossfit. Greg Walls owner of Performance Experience sits down with Coach Mo, and discuss the fitness industry and How they impact young athletes, and try to help them earn a Scholarship in their desired sport. In this episode Coach Mo has an In depth conversation with two of his athletes turned employees. They touch on what it is like to be coached and mentored by Mo. They dive into Life and the Culture of Elite Fitness HQ. Anastasia Stewart & Bradon Hunt first Athletes taken into Mo Mentor-ship program discuss what they have learned and how it has impacted their lives. The Culture of Elite Fitness HQ or The Elite Way what is it, and what does it mean. Elite University is discussed for the first time. 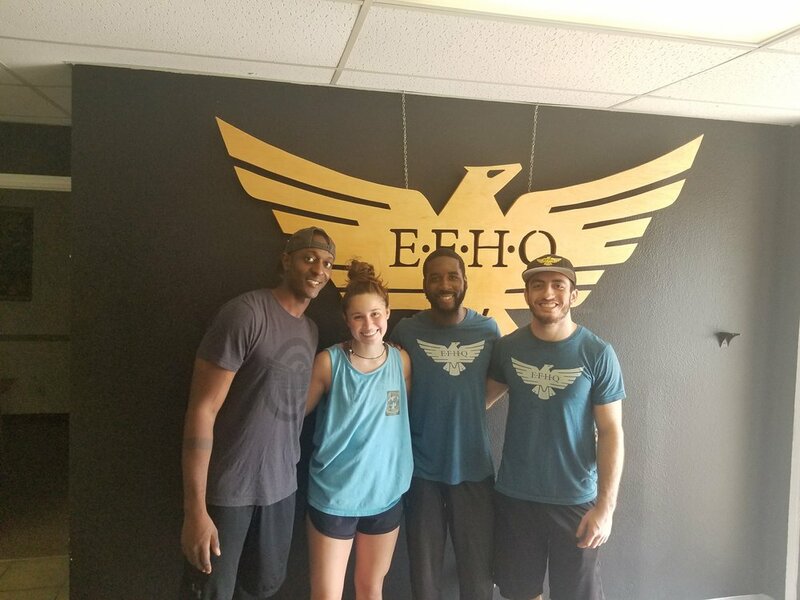 In this episode of the EFHQ Coach's Corner Coach Mo, Coach Eddie, and Coach Bradon delve into their beginnings as trainer's and as coaches. They discuss their most rewarding experiences while coaching, the psychology of coaching, and what being a coach means personally. This Episode includes interviews with Anastasia Stewart, one of Coach Mo's first clients, Drew and Michelle Sherman of Compass Church in Colleyville, TX, and Bradon Hunt. one of the original EFHQ Athletes turned EFHQ Coach. In the initial segment Coach Mo talks with his client Anastasia Stewart. He has trained Anastasia since she was 13. Now that she is 19 and a sophomore in college at Savannah College of Art & Design. Coach & Athlete catch up on there journey & life. Anastasia Equestrian team is 3x Reigning National Champion. Listen to them discuss life and how coaches play a pivotal role in development in and out of the gym. Following Mo and Anastasia we hear from Drew & Michelle Sherman. Drew and Michelle Members of The #EliteFam discuss the impact EFHQ has had on their lives & the Value of Fitness. In the final segment, Coach Mo and Coach Bradon discuss the journey of being an EFHQ Original Athlete turned Coach. This gives an insight to what it’s like to see things from the perspective of an athlete and the perspective of a coach. You will here about things such as culture, community, the learning process of becoming a coach, and the usual sparring between The Old Man and Wolverine. Give it a listen and watch! In this Episode the EFHQ Staff is joined by L.D.Bell Product and Arizona Cardinals DE Josh Mauro. Josh shares his experiences from High School, through his journey to Stanford University, to becoming an undrafted free agent, to ultimately ending up as a major contributor for the Arizona Cardinals. Josh also touches on the values and lessons that weight training helped teach him about competition and life. All we do is WORK at the HQ! Hard Work Always Shows Up! Check out the video version Here on YouTube! In the first episode of the EFHQ Coach's Corner Podcast Elite Fitness HQ Owner Maurice "Mo" Revels is joined by special guest, FC Dallas Club Coach Phil Powers and EliteFam Eddie "Too Fast" aka The Rocket aka that boy from the Ville Foster. The trio discusses their different perspectives on what coaching entails, the different roles a coach can play in a person's life, and the importance of knowing your athletes outside of the weightroom.